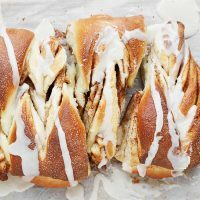 These Cinnamon Sugar Sweet Rolls are filled with cinnamon and sugar and topped with a maple glaze. Perfect to wake up to! It’s been a while since I baked up some sweet bread. These rolls came to be from a craving for warm and cinnamon and instead of the usual glaze, were topped with one flavoured with maple syrup and a bit of coffee. I’m pretty sure that qualifies them as the perfect and complete breakfast. Each of the rolls are shaped individually and then lined up in a row to bake as a sort of loaf. 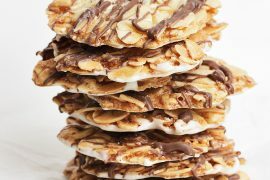 Of course, you an bake them individually, if you like. I tend to prefer baking them close together, because I’m a sucker for that soft bread in between them when they are pulled apart. Like all yeast breads, these freeze well. 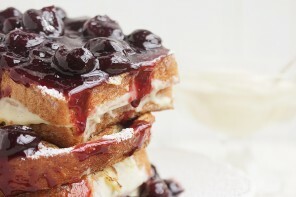 Make them ahead and have them ready for Mother’s Day brunch! As noted above, if you bake these tucked up against each other, you will pull them apart and enjoy nice soft sided rolls. If you prefer crusty, separate the pieces and bake them with a few inches between the rolls. When making any yeast bread, I always start with unbleached all-purpose flour. Unbleached flour is the preferred flour in baking yeast breads. 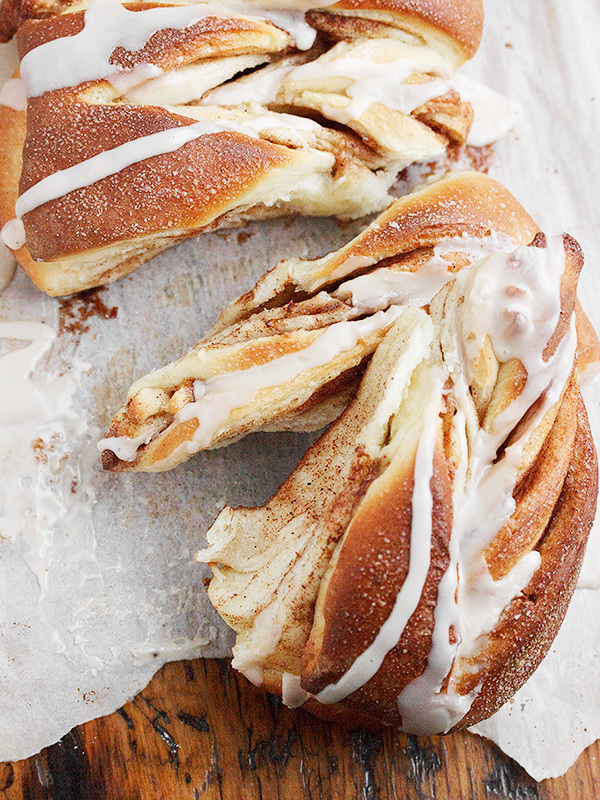 More Cinnamon Goodness! 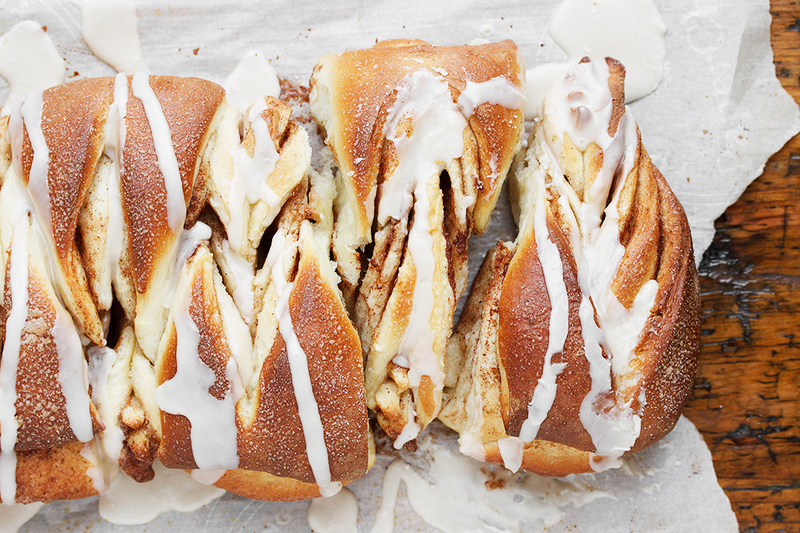 Orange Cinnamon Morning Rolls, Easy Cinnamon Roll Coffee Cake or try my Cinnamon Crunch Loaf. 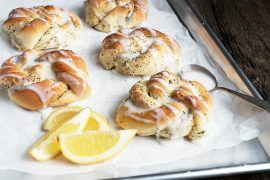 These are a cross between a loaf and pull-apart rolls. By baking them together, you'll get some nice soft sides. These freeze well! For the dough: Add the yeast to the warm water and milk and allow to stand for 5 minutes, until frothy. Add to a large bowl or the bowl of a stand mixer fitted with the kneading hook. Add the egg, butter, sugar and salt and mix. Add 2 1/2 cups of the flour and knead until well combined. Add additional flour in 1/4 cup increments, as needed, until you have a smooth dough. Remove to a greased bowl, cover with plastic wrap and let rise until doubled, about 60-75 minutes. For the filling: Combine cinnamon with white sugar and mix well. Set aside. Line a baking sheet with parchment paper and set aside. Preheat oven to 375° F.
Once dough has risen, place onto a lightly floured surface and deflate gently. Divide dough in to 4 equal pieces. Roll each piece in to a thin circle. Repeat with all four pieces. (Circles will be 12-14 inches. It's not super important the exact size, as long as all for are roughly the same size). Take one circle. Brush with softened butter and sprinkle with about 1/3 of the sugar/cinnamon filling. Place another circle on top. Brush with butter and sprinkle with 1/3 of sugar/cinnamon filling. Repeat with third circle, brushing with butter and sprinkling with the last of the sugar/cinnamon filling. Top with last circle. You should now have a stack, with the top surface bare. With a really sharp knife, cut the circle in to 8 triangle pieces by cutting the whole circle in half top to bottom, then cutting each half-circle in half and then cutting each piece in half again, for 8 pieces. Shaping rolls: With each triangle, using a sharp knife, cut a slit down the middle of each one, starting 1/2 inch from the pointed end, to within 1/2 inch of the wide end. Take the tip of the triangle and slide it underneath, then up through the slit and then pull it back towards where it started. Repeat with each of the 8 triangles. Line all the triangles up side by side, alternating the points, along the centre of your prepared baking sheet. Brush top of loaf with a bit of milk and sprinkle with some granulated sugar. Let rest for 10-15 minutes, then pop in to preheated 375° F. oven. Bake for 20-25 minutes, checking at 15 minutes for browning and cover loosely with aluminum foil, if necessary. Remove loaf on parchment to a wire cooling rack to cool. Prepare glaze: Add maple syrup to icing sugar. Add enough coffee to make a thin glaze. Drizzle over rolls once they have cooled. Can you explain no.4 again ? I don’t quite understand what you mean taking the tip of the triangle and slide it underneath and pull up. I would love to make this heavenly bread! Thank you. Hi Patty, I understand your confusion. It’s tricky to explain, but simple to do. So your triangle of dough is in front of you, with the wide end towards you. You cut a slit in the centre of the dough, but not cutting so much that you cut it in to two pieces :) A couple of inches. Now take the pointy end that’s furthest away from you and fold it under the dough (towards you) and bring the point up through the slit you just cut. Pull the pointy end through and then place it back where it started. So you’ve just made a twist in the middle. Hope that makes sense. Enjoy the bread! Omg! This looks fantastic! Winner. Thanks so much, Karen. It was delicious!! Thanks so much, Row. I’m sure you will enjoy this one! Thanks Jules. It was delicious! Hope you have a great weekend as well! That first photo made my mouth water! Cannot wait to try this. Thanks so much, Carrie. Hope you enjoy it! The new site is FAB! I love the big photo at the top! Thanks so much, Katrina. I’m loving the ability to do a big photo whenever I want. I won’t always, but change is nice. Thanks so much, Sophie. Happy to teach you, anytime :) These rolls were great. I loved the glaze, especially. Thanks Phi. I have a bunch in the freezer I plan to bust out this weekend :) And thanks re the new design. I’ve been puttering around with it for 2 months. Kind of a relief to be able to stop playing with it. This is such a gorgeous loaf, love the maple glaze! Thanks so much, Laura. The glaze was perfect with these. Thanks Julia and yes, you must try this!